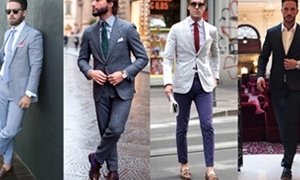 A lot of men are wondering what is business casual? What are the do’s and don’t when wearing the attire? Well, business casual is a style that is mainly for business uses. This gives you a bit of a professional look while having the comfortable casual outfit. Business casual attire will make you look neat as well as sophisticated even you are dressed down from the formal business outfit. Below is the guide on what proper pieces of clothing to wear if you want to achieve that perfect business casual look. When you are trying to go for a business casual outfit, make sure to start with the basic and build your closet with clothes that are so easy to mix. This will give you an easy time to pick your outfits. Simple shirts are number on the list. Pants, jackets, ties, and belts should be present too. Mix and match your clothing pieces to have different looks every day. For every men’s style, the fit is the most important thing in every clothing especially if you’re wearing a tailored piece. Clothes that perfectly fits you could make you look way better and give you a different look. Wearing too large or too fit will make you look bad so be sure to have a perfect size. Once you master this, no doubt that you’ll slay your business casual or any outfit you’ll wear. Shirts are necessary when it comes to business casual or any other outfits. Dress shirts are common for a business casual look. Try to get a simple colored shirt like light blue or white. They are very simple but will give you a very nice aura. Polo Shirts can do the job too especially in a hot summer season but make sure that the attire is allowed in your workplace.Try to avoid shirts with bold colors and patterns since this will make your entire look strong. Tuck your shirt in whenever you plan to go business casual. Also, try to wear some tie or leave your top buttons undone. Business casual pants should always be appropriate and look a bit formal. Jeans are kind of a no, no! We often use chinos, khakis corduroy or dress pants for a business casual look. These kinds of pants are more elegant and will surely give you that casual vibe. Go for the classic black, grey or navy blue pants. They are one of the most sophisticated colors you could choose from but of course, you can always go out of the standard and try to experiment with other colors. Just make sure that they are properly muted and goes well with your shirt and blazer. If so, then you are good to go! There are a lot of shoe options when it comes to business casual style. Sneakers can be the first thing to come to mind since they are pretty casual and comfortable. But more often we consider that the sleekier the shoes the better. Brogues, Derbies, and Oxford can be best options for this. Its smart and solid look would give you a neat and classic fashion. Loafers can also make you look dope so you can opt for it too. Wear shoes that would match the color of your pants. Black and brown are the most proper shoes to wear and it goes along with any pants color. Business casual outfit requires you to wear suits from time to time but it isn’t that necessary as long as you have a blazer with you. Gray and navy blazers are the most common pieces to wear. Blazers make your whole outfit less formal than wearing a full suit. Make sure to have your blazer perfectly fit, relaxed and made from soft materials so that it’ll make you feel comfortable. There are a lot of brand options for the blazer to choose from. Some great blazers are from Boglioli, Reiss, J.Crew, and other Italian brands. Sweaters and cardigans are perfect options if you don’t have a blazer available in your wardrobe. Though sweaters are known to be used during winter, you can still wear them in any season. Just grab a light sweater or cardigan so that you won’t feel hot. Forget those knits first and try to focus on the color of your sweater or cardigan. You could always opt for solid colors as long as it goes great with your shirt underneath. Ties are not essential for business casual attire. They are actually not really worn and just left at home. However, it depends on what you are wearing. e.
If you are not wearing a full suit and wanna go to the business side, try to accessorize your shirt with a tie. You could also put it on when you are wearing a cardigan. Basic black colored ties are usually paired in a business casual outifit.